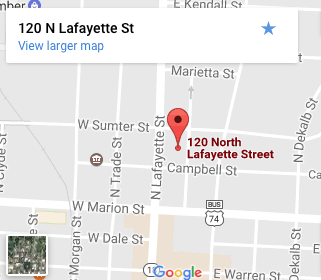 Life comes at you fast sometimes – things where you have no control like hurricanes, floods, and …. cancer. During our recent encounter with life, I have learned so much. Joel and I have walked through a storm of life, when just recently he was diagnosed with leukemia. We were taken back because Joel is so healthy. However, we knew whatever the outcome of this storm, we were going to be OK. Why? Our faith is strong enough to carry us through. Joel and Lavery had planned to go to Philmont, New Mexico for a Boy Scout trip that they had both dreamed of going on together as Joel went when he was a teenager. 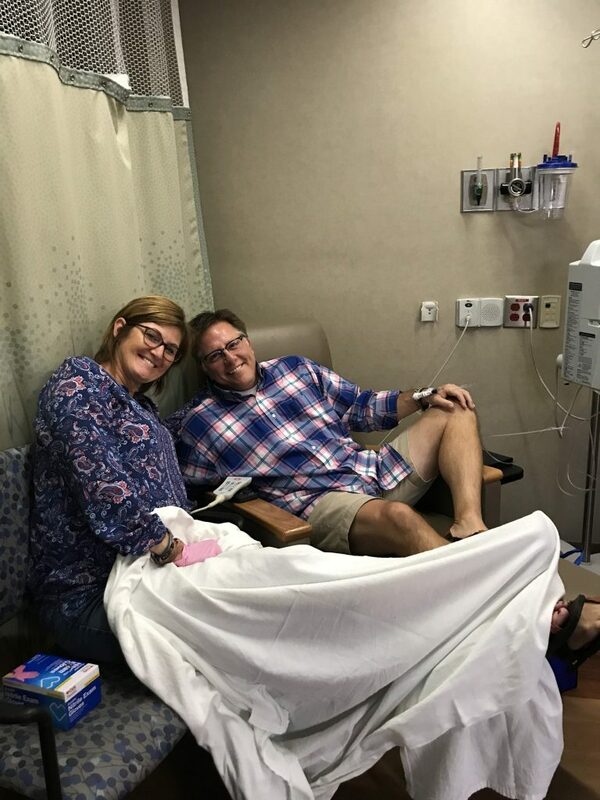 As they were in Colorado traveling to their destination the diagnosis was confirmed. As they were away, I had a lot of time to think about all that was going on. Zinnia popping up in August! The way I process things is to go to my flower beds and work. I feel closer to God when I have a trowel in my hand and the sun on my back. 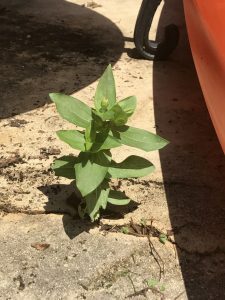 One day while I was blowing off the drive way, I noticed a zinnia growing in the cement. I left it there to see if it was going to survive in such a challenging location. I have been amazed at how the roots have grown through the cement and how this little sprout survived the heat of the summer. As the winds and rains from Irma have come and gone this zinnia has grown and even produced beautiful flowers. I realize that it has thrived because of its DEEP roots. During this storm in our lives, we have experienced so much love from family and friends. Cards, messages, texts, visits, food, chocolate pies and lots of prayers have helped carry us through. Being shown the love of Christ has definitely helped our roots get stronger. During the storms of life, we have been able to flourish because of our roots. I have become more thankful for our deep roots in our faith, family and friends. 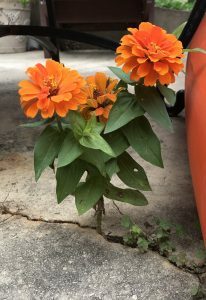 We all need to be like that zinnia – with roots deep and strong. Sometimes we are but sometimes we are not deep enough. During the storms of life we all learn the beauty that comes from the establishment of the depth of our roots.